Tallgrass prairie once covered 170 million acres of North America. Today less than 4% remains, some of it under the protection of the Tallgrass Prairie National Preserve in the Kansas Flint Hills. A ranch since the 1880s, the land in the preserve wasn’t used for agriculture, conserving the tallgrass prairie. We spent a few hours in the preserve on our return from Texas last March. After a stop at the visitor center and a brief tour of the historic ranch buildings, we set off for a hike (3.5 miles – Ranch Legacy/Scenic Overlook Trail loop). Although the prairie was still partially snow-covered, the sheer expanse of the land was striking, as well as the silence. While hiking we encountered our second bison herd of the trip. The ranger had warned us that they were “rather moody lately” but they didn’t seem to mind my antics as we walked through their pasture. The bison are a relatively new addition to the preserve, reintroduced to the area in 2009 with 13 bison from Wind Cave National Park, with the hopes of growing the herd to near 100 in the future. 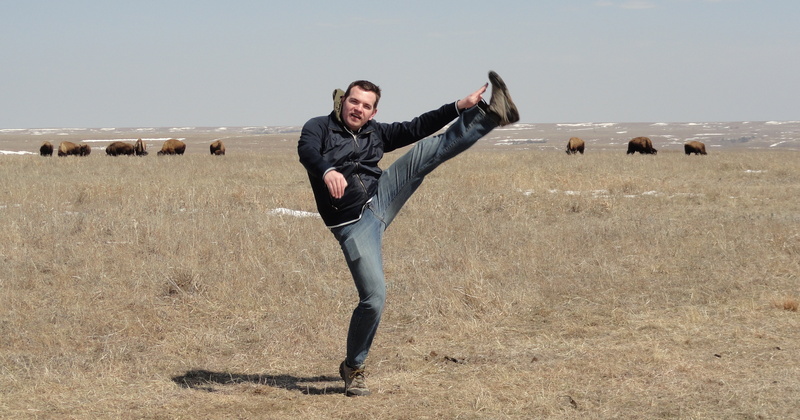 This entry was posted in High Kick Photos and tagged bison, High Kick, hiking, Tallgrass Prairie National Preserve. Bookmark the permalink.